While in the Navy in Japan during the Vietnam era, Mike Melton studied the work of 3Rensho and returned to Columbia, South Carolina in the early 1970s to set up his frame building business. He was very active in racing (both he and his first wife Debbie) and in frame building in the southeast. Mike's easy manner and charm made friends in all cycling circles. While successful at all styles, he soon focused on tandems and shifted his workshop to Delaware, Ohio. Melton's shop received national press when he hired Vietnamese refugees to work in his atelier. That business failed in 1983. Mike then went to California for a stint with Santana before returning to head up Huffy Corporation's Special Projects Division in the Dayton, Ohio area. There he developed and built advanced bikes to be used by Greg LeMond and the USA team in various forms, including the Olympics in 1984 & 1988. 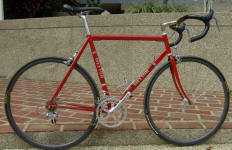 Olympic Frame Builder Michael Melton passes away. Michael “Mike” Melton, 61, the builder and designer of bikes ridden by the successful 1984 and 1988 Olympic teams, died in his sleep last Thursday. Melton had battled a rare neurological disease over the last four years, believed to be spinal cerebella ataxia, similar to ALS or Lou Gehrig's disease. He spent the last eight months at home with the care of Hospice, and is survived by his wife, Jamie Melton, and son Zachary. After starting out as a frame builder in Columbia, South Carolina, Melton moved Delaware, Ohio, eventually closing down his frame building business to join Huffy to head its Technical Development division. Since Huffy was a major Olympic sponsor at the time, Melton headed up developing the ’84 and ’88 teams frames. He also pioneered the use of carbon fiber in the industry. A funeral for Melton was held earlier today at 10 a.m. at St. Philip Catholic Church in Franklin, Tennessee, with the burial service to follow at 1 p.m. at the Middle Tennessee Veterans Cemetery, in Nashville, Tennessee. Publicity clippings from the Melton tandem shop , circa 1982.